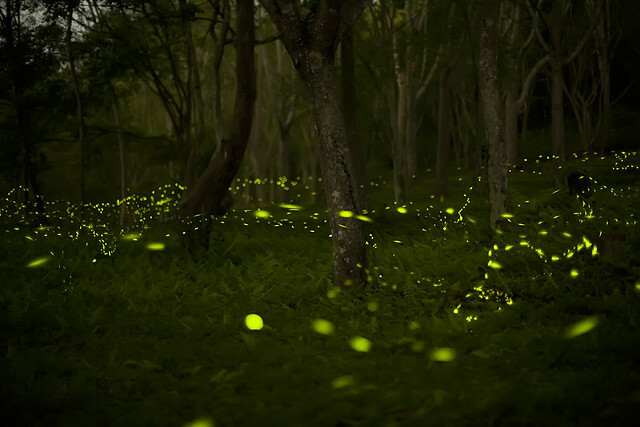 Find fireflies, help keep the forests alight « Nothing in Biology Makes Sense! Across eastern North America, one of the most magical signs of summertime is the beginning of firefly activity—hundreds or thousands of flying beetles, their abdomens glowing or flashing, filling twilight backyards and woodland clearings with floating lights. sustainability and stewardship through the participation of local communities in environmental science research. The Clemson Vanishing Firefly Project offers a mobile app that everyone – from elementary students to seniors – can use to measure firefly populations in their communities from neighborhoods, to parks and anywhere in the world they may go! To help, you follow the project site’s instructions for learning how to count fireflies, then use a smartphone app or a webpage form to report what you see, when, and where. Why not collect some data while you admire the lights in the forest? This entry was posted in biodiversity, conservation, field work, science communication and tagged citizen science, fireflies. I went to the site and it looks as if they were only collecting observations made on May 31 – or am I missing something? That’s what I thought, but then I went to the observation form and it has noplace to put the date. It seemed unlikely to me that they would not care about the date of observation, so I assumed that they were only collecting observations from a set date.